The Humble Store Summer Sale—technically the End of Summer Sale, but who wants to think about that?—is now underway. And even if you're saying to yourself, "I can't possibly afford to spend one more penny on videogame deals," this is still worth your time because until August 31, you can snag a copy of the Humble Deluxe Edition of Stealth Inc. 2 just by showing up. The summer sale also introduces the new "Build Your Own Bundle" feature, which offers increasing discounts on game prices as you buy more of them (66 percent off for buying three, 72 percent for four, 75 percent for five, although they're currently limited to Codemasters and Telltale), and there will be 12-hour flash sales and publisher deals featuring Bethesda, Ubisoft, 2K Games, Warner, and others to be announced later. As always, ten percent of all purchases goes to support charity, and you may now choose from among 35,000 different charities in the US and UK to support. 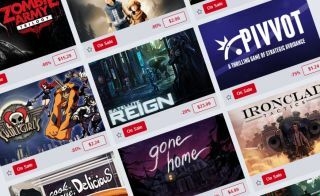 The Humble Store Summer Sale is live now and runs until September 11.